300 Watts (150 x 2). Two-way speaker system with 10" woofer. 7 Channels. Custom rubberized knobs. 6 combination XLR 1/4" inputs. RCA/3.5 TRS media inputs. USB MP3 plackback. Patented FLS® (Feedback locating system). Digital multi-effects. Mid-morph®. LCD screen for ease of file playback and effect selection. Seven-band graphic equalizer. 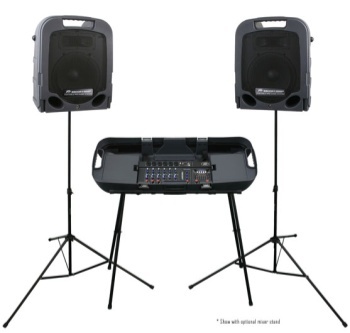 Two folding speaker stands. Two 15' speaker cables. Storage compartment for optional accessories. Convenient package with luggage-style wheels. Weight Unpacked: 52.50 lb(23.813 kg). Weight Packed: 64.00 lb(29.029 kg). Width Packed: 17.62"(44.7548 cm). Height Packed: 39.75"(100.965 cm). Depth Packed: 16.62"(42.2148 cm).